Those of us who live above the Mason-Dixon Line recognize what it means when the air becomes crisp and the leaves turn shades of red, yellow and orange. It means concrete damage is just around the corner. Although we like to think of concrete as a "solid" material, it’s more like a stiff sponge than a solid block of stone. And like a sponge, it’s very absorptive. As a result, liquids like water readily penetrate concrete and, when exposed to freezing temperatures, that water becomes ice. When water freezes to form ice it also expands, creating internal tensile forces on concrete that can cause it to crack. Concrete has very high compressive strength, anywhere from 3,000 psi and beyond. Compressive strength is a measurement of how well it can withstand an external force that wants to compact it, like the weight of a car rolling over a concrete driveway. But concrete has relatively low tensile strength… about 1/10th of is compressive strength. And the tensile forces generated by water that expands during freezing temperatures can easily cause concrete to crack, scale or delaminate. During winter months there are recurring temperature changes resulting in frequent "freeze/thaw cycles" as snow falls, melts, is absorbed by concrete and refreezes repeatedly. This damage can be aggravated by the use of deicing chemicals, which cause concrete to undergo additional freeze/thaw cycles as ice is melted and refrozen. Deicing chemicals can also allow concrete to become "super saturated", and hold more water than it would naturally. And of course, more water means more expansion as it freezes. Because this freeze/thaw cycle can be very damaging to concrete, customers are naturally anxious to protect their driveways, walkways and other concrete investments. 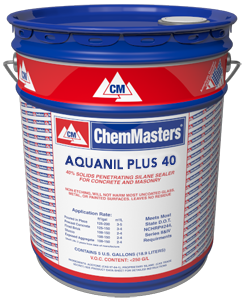 Every fall our technical service department is bombarded with a common question… "which of your sealers is the best protection for my concrete?" Freeze/thaw cycling and deicing chemicals can cause surface paste to scale or delaminate. Penetrating silane and siloxane chemistries make concrete water repellant. Freeze/thaw damage is best avoided by not allowing water into the concrete in the first place. Penetrating water repellants like silanes and siloxanes undergo a chemical reaction within concrete to form a hydrophobic (water repellant) silicone barrier. These treatments coat the linings of concrete pores and capillaries, preventing water absorption from the surface, yet remaining "breathable" enough to allow water vapor passing through concrete to evaporate into the air. 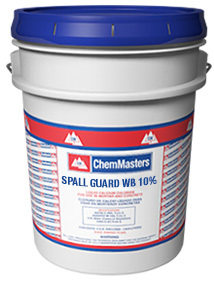 Penetrating silanes and siloxanes also prevent the absorption of chlorides (salts) that can damage concrete and imbedded rebar. That’s an important consideration in northern states that heavily salt their roads to improve driving conditions. And since penetrating silanes and siloxanes work below the concrete surface, they have the added benefit of not changing its appearance or slip resistance. Being below the surface also means they aren’t subject to the same abrasion and wear associated with a typical surface coating. Although what is "best" differs from person to person, there are many good reasons why anyone would want to consider using a penetrating silane or siloxane water repellent to protect concrete during the harsh winter months, and throughout the year. 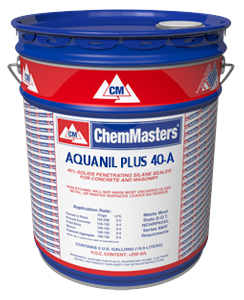 ChemMasters makes a full line of penetrating silane and siloxane water repellants, including Aquanil Plus 40, Aquanil Plus 40-A, Aquanil Plus 100 and Spall Guard WB 10. Click on the links below to view these products.